Otterbein College is on a quarter calendar which means that there are three quarters during the school year (September-June) plus a summer session. Each course carries credit in “quarter hours” which is related to the number of class meetings per week. The academic calendar is adjusted each year so that the autumn quarter ends the day before Thanksgiving. A break from Thanksgiving Day until after New Year’s Day is utilized by students for holiday employment, ensemble or team tours, extended personal travel, or reading and research. Faculty members are involved in research, study, and workshops and seminars dealing with intellectual topics and instructional improvement. Each quarter of the school year consists of 10 weeks and two to three days of final examinations. Summer session meets eight weeks. The actual dates are announced by the preceding December of each year. The requirement for all degrees are based on credit hours. A one-quarter-hour course normally meets one hour per week. Students are expected to spend three hours per week (including class hours) in study for each quarter hour of credit attempted. Throughout this catalog the terms “quarter hours,” “credit hours” and “hours” may be used interchangeable where applicable. The Registrar’s Office maintains a website at www.otterbein.edu. New students register for classes just prior to the term in which they enroll. Currently enrolled students typically register for the entire forthcoming academic year (Autumn, Winter and Spring Terms) during the preceding Spring. Priority to register for upper level classes is given in the preceding Spring to students with disabilities and seniors first, then juniors and then sophomores. To participate, a student must (1) be enrolled for the current Spring Quarter, (2) have paid all current academic year bills, and (3) have no official transcripts still due the College. There is no priority registration after Spring. Students, including those with senior status, who register from that point on may encounter some closed courses and will likely wish to use the wait list system. A written detailed description of the wait list process is available on the Registrar website. The College reserves the right to refuse registration to a student who is failing to make satisfactory progress toward his or her degree. The first four days of each term are designated late registration. Returning students who have not previously scheduled any classes for the term in question will be assessed a $75 late registration fee. Newly admitted students who wait until the first week of classes to register will also be assessed a $75 late registration fee. The fee will be charged to the student’s account. The penalty fee may later be appealed in writing to Academic Council if the student feels there is a valid reason for requesting such a refund. The appeal must be submitted in the same term for which the fee was assessed. For students who wish to accelerate their studies, Otterbein offers a Summer Session. Courses vary in length, but most are held over an eight-week period beginning in mid- June and ending in mid-August. Summer Session course offerings are announced around December 15 at which time registration opens. For a list of course offerings, registration form or application for admission, contact the Office of Continuing Studies. All requests to audit courses are subject to final approval by the Registrar. Confirmation or declination will be sent shortly after the registration is processed. Among courses that may not be audited are those that consume laboratory, computer or other additional program resources and those in high demand by credit-seeking students. Demand fluctuates which means that at some point in time any course has the potential of not being available for audit. Audit expectations are determined by the instructor and thus may vary from course to course. It is the student’s responsibility to discuss expectations with the instructor prior to the start of the class or no later than the first class meeting. Changes from audit to credit or credit to audit must be made during the published add/drop period. Audits are graded on a satisfactory/unsatisfactory basis and appear on the transcript record with a grade of S or U. An audit may not be substituted for a required class… the required class must be taken for credit. The repeated course must be either (a) the same Otterbein course that was originally taken or (b) the direct equivalent at another institution as determined by the Registrar’s Office. When in doubt, obtain written clarification from the Registrar’s Office. No other College personnel are authorized to make the clarification. Students must inform the Registrar’s Office in writing when a course is being repeated and must do so at the time of registration. Courses must be repeated at Otterbein unless written permission to take the course at another institution is obtained from the Registrar’s Office. When the repeat is finished, the Registrar’s Office must be notified so that the repeat can be recorded. The credit hours must be the same in order to replace the grade in its entirety. For Autumn, Winter and Spring Quarters, the deadline for adding a class that begins in the same quarter is the third day of the first week of the quarter. There are three different deadline options for dropping an Autumn, Winter or Spring Quarter class that begins in the same quarter. The outcome is noted in parenthesis beside each option. After the seventh week or 35th day, a class may not be dropped. Deadlines for Summer Session are comparable to those for the regular academic year, but are adjusted slightly due to the shortened weeks in the term. The specific dates are published in the Summer Session Schedule of Classes available upon request from the Office of the Registrar. Changes may not be made by telephone or by notifying the course instructor. Students who wish to withdraw from one or more classes that began in the same quarter but retain a partial schedule must follow the procedure entitled Change Of Schedule described above. Students who wish to withdraw from all classes that began in the same quarter must officially withdraw from the College by completing a withdrawal form at the Office of the Registrar or faxing a letter requesting withdrawal to the Office of the Registrar (614) 823-1009. The date of withdrawal is the date the notice is received by the Registrar. It is the responsibility of the student to make certain that the written notice of withdrawal reaches the Registrar’s Office with the stated deadlines. If official notice of withdrawal is received before the end of the fifth week or 25th day of the quarter, no record of the registration will appear on the academic record. If the withdrawal is received after the fifth week or 25th day of the quarter, a grade of W will be entered on the student’s transcript for each course. The withdrawal deadline is the end of the seventh week, or 35th day of the quarter. Students must check with the Registrar for withdrawal deadlines of courses that are shorter than the usual ten week quarter. When a student withdraws, all registrations for future quarters are cancelled unless otherwise specified. If a student never attends any classes or stops attending without officially withdrawing, the registration will not terminate. Grades will be assigned under the grading criteria used to evaluate all students in each course and the student will be responsible for all fees and tuition charges for the class or classes. Nonattendance and/or nonpayment of fees does not constitute official withdrawal. Part-time course load is defined as 1-11 hours per quarter. Full-time is 12-18 hours during Autumn, Winter and Spring Quarters and 12-15 hours during Summer Session. For Autumn, Winter and Spring Quarters, an academic overload is 19-20 hours. An overload is permitted when the student was enrolled full-time and achieved a cumulative grade point average of 3.0 the preceding quarter. New students may not take an overload during their first quarter. No student may register for more than 20 hours in a quarter without the approval of the Associate Dean for Academic Affairs. For Summer Session, overloads are not permitted due to the accelerated pace required for fewer weeks of study. No student may register for more than 15 hours without the approval of the Associate Dean for Academic Affairs. Additional tuition is charged for overloads. Waiver of the prerequisites for a course is generally discouraged but may be done occasionally on a case-by-case basis. This waiver may be granted only by the instructor of the course after that instructor’s assessment of the specific student’s history and experiences. Prior to granting the waiver, the instructor must be reasonably assured that the student has had courses, background experiences, or abilities which would generally be equivalent to, or serve to negate the necessity of, the prerequisites. The instructor must also be reasonably assured that the student will not be at an educational disadvantage compared to students who have completed the prerequisites. Waiver of a prerequisite by the instructor does not, expressly or by implication, constitute a representation or assurance of the successful completion of the course. The student remains fully responsible for his/her performance in the course. It is the student’s responsibility to assure that a prerequisite has been met. Independent study is an opportunity for qualified students to work in topics of special interest or areas not otherwise available through the standard curriculum. The course content is determined by the student and the faculty member collaboratively. A maximum of 15 quarter hours may be taken as independent study (390 course number) during a student’s undergraduate career. Of that 15, no more than 10 quarter hours may be taken in the major or minor. The hours for Distinction Research are excluded from these restrictions. Students are required to self-monitor the independent study hours they accumulate and not exceed the 10/15 hour restrictions. Excesses will be noted by the Registrar’s Office at the time the student makes application for his or her degree. At that point, however, graduation may be severely jeopardized. The numbers appearing before course titles indicate the level at which the courses are to be scheduled. Exceptions to this pattern are indicated in the descriptive material following course titles. Courses numbered 100-190 are to be scheduled during the freshman year. Courses numbered 200-299 are to be scheduled during the sophomore year. Courses numbered 300-399 are to be scheduled during the junior year. Courses numbered 400-499 are to be scheduled during the senior year. Otterbein accepts credits from two and four-year institutions that are fully accredited by the appropriate regional accrediting agencies. While there is no limit to the number of credits transferred from four-year institutions, a maximum of 90 quarter hours may be transferred from all two-year institutions combined. Of the courses transferred to Otterbein from all institutions combined, a maximum of 10 quarter hours will be accepted from college courses graded on a pass/fail basis. Only those courses with grades of C- or better will be considered for transfer. Individual departments’ minimum grade requirements may vary. The actual grades are not transferred and thus will not be included in the Otterbein grade point average. Prior to the beginning of the quarter in which the student enrolls, current official college transcripts from all institutions previously attended must be submitted to Otterbein for evaluation. Violation of this requirement will place the student in jeopardy of dismissal. A final official transfer evaluation will be made within one term of the date you have registered for classes and all official transcripts are received by the Registrar. Evaluations are not made until all official transcripts have been received. At the latest, the official evaluation occurs by the end of the first quarter of attendance. All contents of the student’s admission file become the legal property of the College and are not returnable or transferrable. Students may use their intellectual interests, academic backgrounds and experience to gain college credit through the following means. Students are not permitted to take CLEP exams once they have reached senior status (135 or more earned hours). Also, students who have already earned Bachelor’s degrees are not permitted to take CLEP exams. None of the hours may be used to fulfill the College’s residency requirement. Maximum credit = 60 quarter hours. When an examination does not exist through CLEP or PEP, an Otterbein academic department may decide to develop its own method of verifying a student’s knowledge of a course. If an examination is the method selected, a course syllabus and several sample questions will be made available to the student by the instructor providing the grade. A per-credit hour fee is charged for on-campus credit by examination or portfolio. An additional fee may be charged for a laboratory examination. Grading is made on a pass/fail basis. When an Otterbein exam is not successfully passed, a second attempt can only be made by taking the actual class. Failed attempts are not recorded on the transcript record. For additional information including registration forms, contact the Office of Continuing Studies. CLEP exams and their Otterbein equivalencies are listed on the Registrar’s website at www.otterbein.edu. 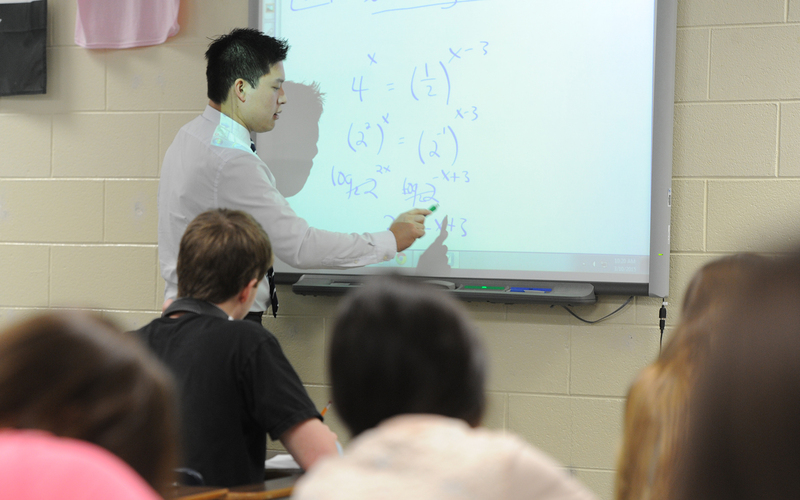 A student who receives a score of 4 or 5 on an Advanced Placement Test in high school will receive credit for the appropriate Otterbein equivalent course (see list of equivalencies at www.otterbein.edu/registrar). Proficiency rather than credit will be noted for a score of 3 for any Otterbein equivalent course except Integrative Studies courses (INST) and Mathematics (MATH) courses or their substitutes (see p. 31). Exemption from INST courses and INST substitutes requires a score of 4 or 5. Proficiency means that the Otterbein equivalent course may be skipped when it is a required, prerequisite, or co-requisite course. Score = 4 or 5: Credit granted for Otterbein equivalant course. Score = 3: Proficiency granted for Otterbein equivalent course except for INST and MATH courses and their substitutes. Students who do not have an IB diploma but who have taken Higher Level IB exams will receive credit on a case-by-case basis for examinations that match courses in the College’s curriculum. A score of 5, 6 or 7 is required. An official International Baccalaureate transcript should be submitted to the Admission Office no later than spring of the senior year in high school. The official International Baccalaureate diploma should be submitted to the Admission Office in June following graduation. Each student will receive a grade report at the end of each quarter, and a permanent transcript of all course work attempted and grades earned is maintained in the Office of the Registrar. The following grades from letter-graded courses are included in the calculation of the grade point average (GPA). The numeric equivalents to the letter grades are in parentheses. The amount of additional time permitted might be no more than a few days or weeks since it should be proportional to the student’s illness or absence, etc. while remaining fair to others who were enrolled in the course. The IP must be completed no later than the following applicable deadline or sooner if prescribed by the instructor: for Autumn IP’s, the last day of the Winter classes; for Winter IP’s, the last day of Spring classes; and for Spring and Summer IP’s, the last day of Autumn classes. Due to extraordinary circumstances, an IP completion deadline may be considered for extension. To receive consideration, the student (not the instructor) must submit a written request/rationale to the Vice President for Academic Affairs no later than the fifth Friday of the term the IP is due for completion. Grades submitted to the Registrar’s Office are considered final unless (1) evidence of an error can be presented, or (2) the student is convinced his or her academic performance was evaluated on other than an academic basis or in a prejudiced or capricious manner. Grades may not be changed by arranging to complete additional work or by meeting criteria not in accord with those applied to all otherstudents enrolled in the course. To appeal a grade, the student must consult with the instructor (or the department chairperson when the instructor is away from campus) no later than the following applicable deadline: for Autumn and Winter grades, the end of Week Three of the following quarter; for Spring and Summer grades, the end of Week Three of Autumn Quarter. Resolution and submission of the revised grade to the Registrar’s Office must occur by the end of the 10th week of those respective quarters. Signatures of both the instructor and the instructor’s department chairperson are required to change a grade. When a grading issue cannot be resolved through discussions with the instructor or department chairperson, the student may present evidence in writing to the Vice President for Academic Affairs indicating an error, the prejudicial basis, or the capricious manner used in evaluating his or her performance. In all cases, this step must be taken no later than five business days beyond the applicable 10th week deadline indicated in the previous paragraph. The Vice President for Academic Affairs shall consult with the student and instructor after which the appeal may be passed on to the Appeals Council for its consultation and judgment. The actual grade change, if deemed in order by the Appeals Council, shall be determined by the Vice President for Academic Affairs in consultation with the student and the instructor involved (or the applicable Department Chairperson if the instructor is unavailable). Class Standing is based on total credit hours earned. A student who maintains the minimum cumulative grade point average on a 4.0 scale as required on the chart below is in good academic standing. Academic Probation occurs when a student’s cumulative grade point average is below the minimum levels established on the chart above. Students placed on Academic Probation are required to meet the academic requirements of their probation and be in good standing within two quarters. Suspension occurs when a student earns less than a 2.0 term grade point average while on Academic Probation. A student will also be suspended when failing to gain good standing in the prescribed period. The first time a student is suspended, the student may apply for readmission after remaining out of school for at least one quarter. A student suspended for the second time must remain out of school for at least one year before applying for readmission. Credits earned at another school while a student is under academic suspension cannot be applied toward graduation at Otterbein. All readmission applications must be submitted to the Office of Admission and acted upon by Academic Council. Other information or steps may be required prior to consideration for readmission as determined by Academic Council. Readmission is not guaranteed. Dismissal occurs when a student is suspended for the third time. Dismissal is permanent. Students who fail to make satisfactory academic progress are subject to the loss of federal financial aid. Satisfactory academic progress is defined as achieving earned credit hours in a least two-thirds of all credit hours attempted. Courses in which IP’s, R’s and W’s are received are considered attempted credit hours. Students who fall below the defined standard for satisfactory academic progress will be warned in writing. Students who receive a warning will have to be in compliance with the defined standard within two quarters or federally-funded financial aid will be forfeited. Warnings are issued as a courtesy; students must assume full responsibility for monitoring their own satisfactory academic progress. The College reserves the right to refuse registration to students who are failing to make satisfactory academic progress toward their degrees. Through the Academic Council, which is a standing committee of the College Senate, an avenue for appealing academic policies is provided all students. Details regarding the appeal process are available from the Office of Academic Affairs. Minutes of past Academic Council meetings are on file in the Library. The undergraduate commencement ceremony is held in June and all graduates (Summer, Autumn, Winter and Spring) are invited to participate. In recent years, guest seating has been limited to seven tickets per graduate. As the commencement ceremony approaches, detailed information will be made available to all students who have applied for graduation. This same information is available at any time on the Registrar’s website, www.otterbein.edu. Copies of official transcripts may be obtained for a nominal fee from the Registrar’s Office. An official transcript cannot be provided when there is an outstanding bill or a loan in default. Requests are filled within five business days. Order forms are available on campus or on the Registrar’s website, www.otterbein.edu.